This comparison was made by Digital Photography Review and it covers pretty much every aspect of these stunning cameras. I shoot a lot of moving objects and nothing would make me happier than to be able to use a camera like these for my work. However, priced at $5,999.00 (Canon) and $6,495.95 (Nikon) I think I’ll settle for something a little more average. 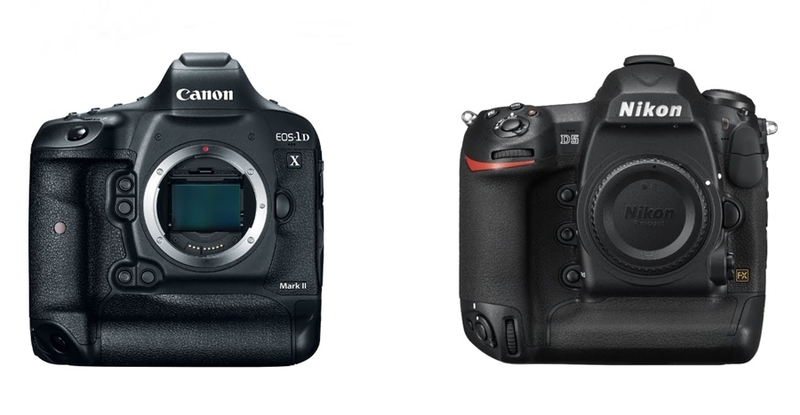 On the face of it, the Canon EOS-1D X Mark II and Nikon D5 offer a very similar sensor specification. And at 20 and 21MP respectively, their output resolution is indeed almost identical, but there are differences. Unusually, in the contest between Canon and Nikon, the EOS-1D X Mark II’s sensor has the wider dynamic range at base ISO, which represents a major step forward for Canon’s pro lineup. Although not a match for the best-in-class performance offered by Sony’s current full-frame sensors, the 1D X Mark II bests the D5 by around one stop. Oddly, in terms of dynamic range, the D5 has moved backwards compared to its predecessor, the D4S. The practical upshot of this is that the EOS-1D X Mark II is much more suitable for the sort of ‘expose for the highlights and pull the shadows up later’ approach to photography that makes sense in tricky lighting conditions. With the D5, you have to chose. Expose for highlight detail and color and lose definition in midtones and shadows, or expose for midtones and say goodbye to the brighter areas. With the EOS-1D X Mark II, while not best-in-class, Raw files are much more flexible. Of course, not everyone requires super-wide dynamic range from Raw files. For some photographers (and we suspect most photojournalists) high ISO Raw, and particularly JPEG, image quality will be more important. In this respect the D5 offers marginally superior performance to the EOS-1D X Mark II, although the difference isn’t that great within what any sensible photographer would consider a ‘normal’ ISO sensitivity span. The D5 yields better quality JPEGs at ISO 409,600 (the EOS-1D X Mark II’s maximum setting) but above this, its additional ISO sensitivity settings (all the way up to 3.28 million) become progressively less useable. More useful is the D5’s backlighting of major controls, which is a huge benefit when changing settings at night. As flagship sports and action cameras, the Canon EOS-1D X Mark II and Nikon D5 incorporate the best autofocus systems that their respective manufacturers know how to make. In Canon’s case that’s a 61-point AF system, supported by a 360,000-pixel metering sensor to aid with subject tracking (‘iTR’ in Canon-speak) and face detection. Of the full 61 points, 41 are cross-type and the center point is sensitive down to -3EV in single-shot AF mode. Additionally, the 5 central points are dual-cross type, containing a long base-line x sensor in addition to the and + cross sensor for enhanced AF precision with F2.8 and faster lenses. Indeed, we’ve found these 5 points to have nearly mirrorless (contrast-detect) levels of precision. The D5’s AF system features 153 points, 99 of which are cross-type, and of which 55 can be directly manually selected. The entire AF array is sensitive down to a rated -3EV, and the center point can still be used at -4EV. The D5’s metering sensor features 180,000 pixels, and works with the autofocus to create a ‘3D AF tracking’ system with face detection. While the Canon EOS-1D X Mark II’s autofocus is very good, the D5 leaves it in the dust. The D5’s AF system is without question the most capable of any camera that we have ever seen. The almost spooky reliability of 3D AF tracking, despite a lower resolution metering sensor for subject analysis, is a game-changer for all kinds of photography – not just fast action. However, if you’re a birder or wildlife photographer, you’ll appreciate that all 61 AF points on the 1D X II focus with proper lens/teleconverter combinations down to F8. Easy to miss in the D5 (partly because Nikon hides it so well) is automatic AF point calibration. This is a massive time-saver when calibrating fast lenses for accurate focus, and a major selling point over the EOS-1D X Mark II (and earlier Nikon cameras). Both the Canon EOS-1D X Mark II and Nikon D5 are – probably – approaching the limit of how fast DSLRs can be made to take pictures before shaking themselves to bits. The EOS-1D X Mark II is the quicker of the two cameras, topping out at 16 fps in live view mode, while the D5 lags a little behind at 14 fps. With autofocus and autoexposure, the Canon can shoot at up to 14 fps, while the D5 maxes out at 12 fps. It’s worth noting the Canon can shoot at 16 fps and still display a review image between each shot – allowing you to follow your subject – while the screen on the Nikon stays blacked-out when firing at its 14 fps maximum frame rate. Furthermore, the 4K frame grab feature on the EOS-1D X Mark II effectively allows for a 60 fps silent shooting – with AF. Rolling shutter is minimal, so this is actually a usable way of capturing the decisive moment when it comes to very fast action. The D5 can shoot silently at 30 fps for 5s, but you’re out of luck if you want autofocus, and only get 5MP stills out of it in this mode. On the numbers alone, the EOS-1D X Mark II has the edge in terms of shooting speed – especially when you consider 4K screen grabs at 60 fps with surprisingly capable AF, and a far more usable high (16) fps mode. It goes without saying that the Canon EOS-1D X Mark II and Nikon D5 are tough, durable cameras. But there’s more to durability than just physical toughness. A major consideration when using a camera in rough conditions – especially in remote or primitive locations – is battery life. The Canon EOS-1D X II’s battery life is CIPA rated at 1210 shots per charge. Not bad. But the D5 is rated at an incredible 3780 shots – almost three times as many pictures per charge. Now, CIPA ratings should be taken with a pinch of salt, since they’re based on a series of use-case tests meant to approximate ‘normal’ use and in our experience, actual battery life is almost always better than the rating. We’ve shot well over 2000 frames per charge on the EOS-1D X Mark II without coming near to running its battery flat. But the Nikon D5’s endurance in normal use really is quite extraordinary. Read the full article over at Digital Photography Review.